Traeger vs Pit Boss: Are Either of These Pellet Grills Worth Buying? So you want to get a pellet grill and are torn between a Traeger and a Pit Boss. I get it. Traeger’s are expensive and the Pit Boss looks nice. 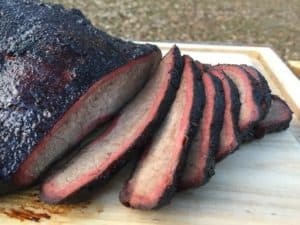 I have spent quite a bit of time looking over both of these brands and do not hesitate to say that if you are looking at a Traeger vs Pit Boss comparison then the answer is Pit Boss. If you read the comments section at the bottom of this post you will see that for a few years I did not recommend Pit Boss. However, in 2018 Pit Boss made a serious upgrade to their warranty and in 2019 launched the Pro Series Pellet Grills that impressed the heck out of me. It looks to me that Pit Boss has gotten serious about making high quality pellet grills and isn’t interested in just being the cheapest player in the market. Traeger was a founder of the pellet grill industry with a history that goes back to 1987. The company was founded by it’s namesake, Joe Traeger, and was based in Oregon for many years. Eventually the company was sold to private equity groups who fired almost everyone in Oregon and moved operations to Utah. 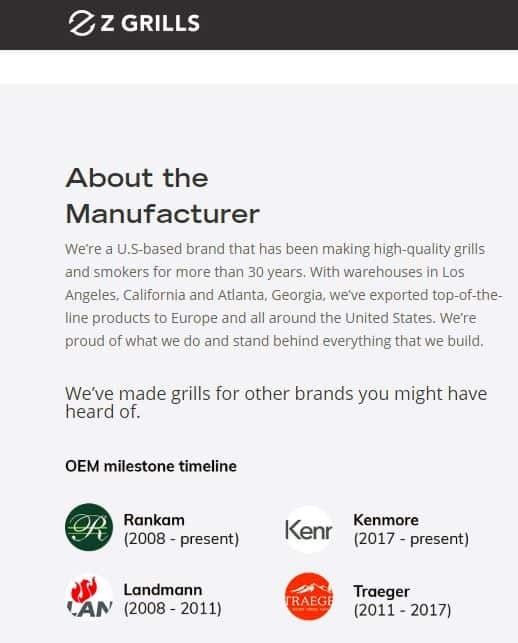 Traeger held the original patents for pellet grills but as soon as they expired the market was flooded with other companies wanting a piece of the market. The Pit Boss Smokers are made by Danson’s, the same folks behind the Louisiana Grill brand. Louisiana Grills are fine smokers that can go toe to toe with a Traeger. The Louisiana Grills are also priced the same as Traegers. While Louisiana Grills made progress in taking market share from Traeger the folks at Danson’s realized that they could sell more grills if their product was less expensive. And thus the Pit Boss Smoker brand was born. Price: Pit Boss has a grill that matches the size of every grill that Traeger has. Each of the Pit Boss grills is between $100 and $200 cheaper than its Traeger counterpart. Warranty: Traegers come with a three year warranty compared to five years on a Pit Boss. Heat Management: The location of the fire pot and how heat is distributed is very different. Flame Broiler: The Pit Boss Grills have a sliding flame broiler system that is absent on Traegers. 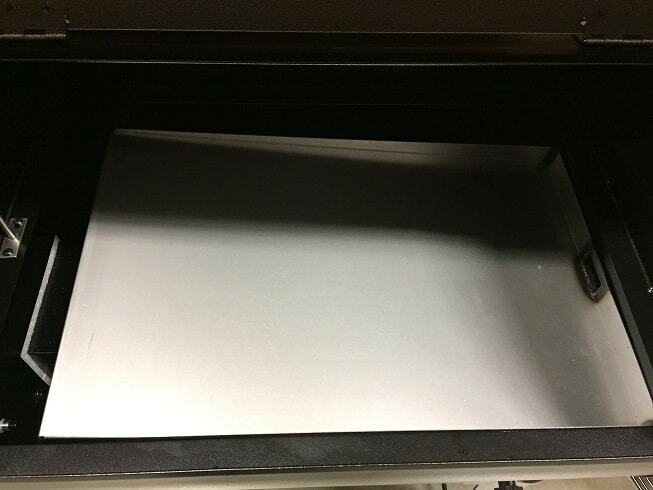 Let’s take a closer look at the differences in heat management between the two brands. On a Traeger the fire pot is on the far left side of the grill and is covered by a heavy steel heat deflector. 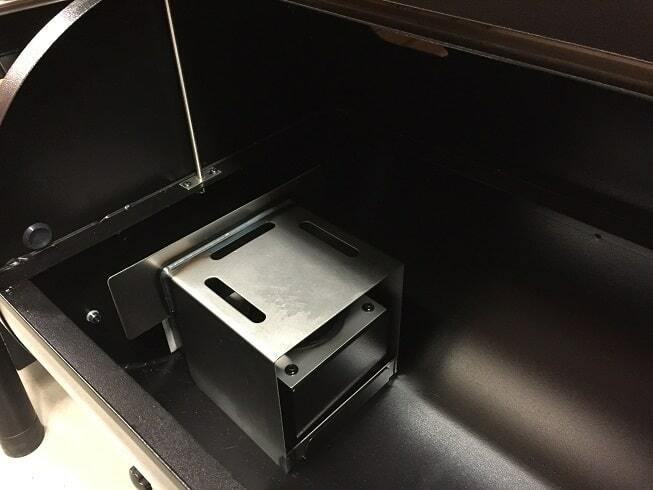 The fire pot and heat deflector are then covered by a solid metal grease tray. On a Pit Boss pellet grill the fire pot is located in the CENTER of the grill and does NOT have a heat deflector over the pot. The fire pit on the Pit Boss is covered by a domed metal shield with open slits. The open fire pot and the slits in the shield are intended to let you do do “open flame grilling”. This is a handy feature when you want to sear off a flank steak after you have smoked it. When you want to smoke instead of grill there is a second metal shield that slides over the open slits. I don’t have a strong basis to judge which heat management system is better. They both work fine. Pit Boss has a much better warranty that Traeger. Pit Boss has a Flame Broiler system and Traeger doesn’t. Pit Boss is less expensive than Traeger. The ONLY place where Traeger beats Pit Boss is in marketing and branding. Traeger was one of the very first manufactures of pellet grills and they do a great job of building on that history. You can go on Twitter and Instagram and find loads of celebrities and amateurs that are proud members of the Traeger Nation. Traeger sponsors a lot of professional barbecue cooks and has been great at building the brand that promotes the image of a high quality product. But when it comes to establishing yourself as a serious player through your long track record Pit Boss recently pulled a pretty slick trick. The Traeger brand was built by Joe Traeger back in the 1980’s. Joe eventually sold Traeger to a private equity firm who rebuilt the company but kept Joe’s name on the front door. But Joe Traeger, the true founder of the pellet grill industry, is still around and working. Want to take a guess at what he is doing these days? Joe Traeger is designing pellet grills for Pit Boss. Treager is, in my opinion, simply surviving through branding. There are simply too many other companies out there who are offering either equivalent and less expensive products or grills that are more expensive but which offer more features. Let’s take a look at some options. If you are looking at a Pit Boss primarily because it costs less than a Traeger then you ought to take a look at a brand called Z Grills. Z Grills just started selling pellet grills into the retail market in 2017 but has a long history of making pellet grills for other companies. Below is a snapshot I grabbed off of their website a year or so ago. Take a peek at the lower right hand corner. These are the same folks that were building pellet grills for Traeger for six years. Z Grill stopped manufacturing for Traeger and is now selling directly to the retail market. When you look at the Z grill products they appear to be clones of Traegers. Same controller, same drip tray, same firebox. Everything looks identical on a Z Grill to a Traeger except the branding and the price. Z Grills are budget priced like Pit Boss and carry a three year warranty like Traeger. I am cooking on a Z grill these days and really enjoy using it. A lot of folks are introduced to the Trager brand through the infomercials for the Traeger Renegade Elite. And while the Elite and other models like the Tailgater are fine cookers there are other brands that make better products. If you are willing to pay for high end performance then take a look at Rec Tec pellet grills. The Rec Tec grills have a next generation temperature controller and are just flat out beautiful grills. Another company that offers a super high quality is Grilla Grills. One of my favorite high end grills is the Camp Chef Woodwind with the infrared side Sear Station that is featured on my list of The Best Pellet Grills for the Money. Great to see an honest and unbiased review. It is a competitive business building these smokers in the US, so they are looking for any way to cut costs. they are definitely built in China my man. 2-3 season doesn’t mean it’s going to fall apart after that. 2-3 season means it’s not going to work that well in cold winters. Keep reading it explains that in the manual! All grills/smokers can experience that to some degree. Not sure this review is actually based on anything?? Agree with Rj009…it means you can use it 2-3 seasons out of the year. David, unless you know that the Pit Boss models actually fall apart after 2-3 years, you should probably stop saying that. I appreciate and respect your comment. There are two ways of interpreting what they are saying..either they are saying that you will only be able to use the grill for 2-3 seasons of the year OR the grill will only last 2-3 grilling seasons. I welcome, and would appreciate, Pit Boss owners sharing how long their grills are lasting. I will also beat a dead horse. If Weber will back the $500 Spirit grill with a 10 year warranty then why can’t Danson back up a $500 grill with something better than a one year warranty? I bought a pitboss. I caught on fire day 2. I called support and the first thing they wanted me to send photos to start the process of deciding if the fire was my fault. If they fire was their fault they would send me parts to fix it myself. If they can’t put it together right how do they expect me to do it? I see Pit Boss and Louisiana grills both make a 7 series cabinet smoker. I am looking for a smoker that can cook a larger quantity of meat for a gathering. Thoughts on these cabinet brands? Is one better than the other? Or both the same as owned by the same company? Others look great but get really pricey. Dave, I have a question in with a company rep to see if they will answer. Yes, you can use any brand of pellet in a Traeger. If you do use a different brand of pellet in a Traeger though, the warranty is then void. Tying the warranty to use of a particular brand of pellet would be in violation of federal law. (Reference Here). The Traeger warranty currently states that the warranty will be void if “fuels not compatible with the unit have been used”. (Reference Here) The current Owner’s Manual strongly recommend, but do not require, the use of Traeger pellets.